An electrifying evening of instrumental chamber/jazz/rock from guitarist Doyle and his 10-piece ensemble (including five string players) captured on this double-disc set. Jazz Fest founder and producer, Frank Malfitano, has announced the Syracuse Jazz Fest has added a fifth concert to its series. Mark Doyle’s Guitar Noir Project has been added to the sixth Annual Legends of Jazz Series at O.C.C. on Saturday, November 22 at 7:30 pm in the college’s new Recital Hall. After a sold-out performance in May at The Auburn Public Theater, then sharing the Syracuse Jazz Fest 32 stage with Big Bad Voodoo Daddy and Trombone Shorty & Orleans Avenue in July, this will be the final appearance of Guitar Noir until April 2015. Unlike the previous shows, the string quintet will be featured for two full sets as the 10-piece ensemble presents the full In Dreams album in set one, then reprise some of the funkier R&B numbers they brought down the Jazz Fest house with in set two. As always, Doyle never rests on his laurels and he has several surprises up his musical sleeve for the audience at O.C.C. The November 22 concert at O.C.C. will feature guitarist Mark Doyle’s critically acclaimed Guitar Noir Project, which features a core quintet composed of Doyle and Terry Quill on guitars, Bill DiCosimo on keyboards, Edgar Pagan on bass, and Joshua Dekaney on drums, along with a five-piece Guitar Noir String Ensemble comprised of Ally Brown, Shelby Dems, and Leila Dean on violins, Claire Marie Wilcox on viola and Kate LaVerne on cello. Doyle’s incredibly varied career began as a child prodigy jazz pianist before seeing The Beatles on the Ed Sullivan Show. His first band ‘Jukin’ Bone’ was signed to RCA when he was in his late teens and produced two albums that were labeled by Creem magazine as “seminal classics of early ’70s hard rock.” He served as lead guitarist/arranger/right-hand man for David Werner, Andy Pratt and Cindy Bullens performing band-leader duties on many tours with them besides numerous sessions with the likes of Hall and Oates, Judy Collins, Leo Sayer and many others. The ’80s found him doing several world tours and television appearances as lead guitarist for Meatloaf and adding a shiny disc to his studio wall by arranging and singing background vocals on “Straight From The Heart’ with Bryan Adams. A move to Boston brought Mark another direction as String Arranger for most of Maurice Starr’s acts including New Kids On The Block, Tiffany and The Stylistics also contributing his production skills and immeasurable musical prowess to each. After a stint in Japan playing keys and acoustic guitar for the Epic/SONY and Pioneer labels, Mark returned to Syracuse and concentrated on his internationally critically acclaimed solo career while producing and performing regionally. 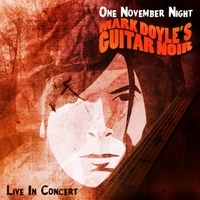 His Guitar Noir and Out Of The Past CDs, along with his double CD/DVD release Solstice At The Cathedral bridge his multifaceted influences and talents, leading to more current work with his blues/rock band Mark Doyle and The Maniacs which is his ongoing guitar project. Doyle is also performing select Opera House concerts as guitarist/pianist and band leader with Mary Fahl (former lead singer of October Project) who recently released, Live at The Mauch Chunk Opera House, reviewed on these pages and previously issued ‘From The Dark Side Of The Moon’ a reinterpretation of Pink Floyd’s classic album in 2011. A long-awaited follow-up to Guitar Noir in In Dreams: Guitar Noir II, plus three studio Maniacs issues, one live CD, a live DVD and a behind-the-scenes DVD have kept Doyle at the top of his game, but if you know the man at all, he doesn’t really know any other way. Tickets for this first-ever full Syracuse performance by Guitar Noir are priced at $20 in advance and $25 on the day of the show, and are on sale now (cash only!) at Sound Garden in Armory Square, located at 312 West Jefferson Street, Syracuse. Only 150 tickets will be sold for this event, so get your tickets early and don’t get left out as many did at The Auburn Public Theater show. Mark Doyle’s Guitar Noir project has enjoyed a banner year, with a sellout performance last May at the Auburn Public Theater followed by an impressive set on the main stage of the M&T Syracuse Jazz Fest in July at Onondaga Community College. Doyle is more than ready to keep the fire burning behind his moody conceptual work, even though he hadn’t planned to reprise the show until next year. Yet talks between Doyle and Jazz Fest founder and producer Frank Malfitano led to the idea of an additional 2014 performance. Doyle believed that Eastwood’s Palace Theatre was too big and the Redhouse Arts Center’s space too small. But a slot within Malfitano’s Legends of Jazz Series, part of OCC’s Arts Across Campus initiative, was just right. The series has already featured Chick Corea and The Vigil and the Heath Brothers (both of which Doyle attended), and will host Cecile McLorin Salvant and the Rebirth Brass Band in early 2015. Most of the Legends of Jazz performances take place at Storer Auditorium, yet Doyle’s Guitar Noir will go on at the new Recital Hall. “It seats 150 people, which is perfect,” Doyle says. And those who attend will get to see a very different kind of show. “It’s the only gig I’ve ever done where you want the audience to fall asleep,” Doyle jokingly says, especially regarding the extremely surreal “In Dreams” set featured in the project. This performance will also highlight the string section throughout both the first and second set. “I love writing for and playing with strings,” he says. “Nobody else is doing this. It’s its own thing and the people who get it, really get it. I love this CD and all the cool choices of songs from the 60's he selected and made his own for this project..The Stones, Doors, Beach Boys, etc..I also love the addition of the string quartet for this Live show and recording.. When I listen it takes me back to a more peaceful place in my mind, a soundtrack of movies and music from my youth.. Well Done Music Man ! Hearing "In Dreams" GNII performed live in it's entierty is just an amazing performance. The band Mark put together and the string quartet Mark arranged adds a new feel to all the songs. Mark's playing on this is truly brilliant especially on "I Go to Sleep". Besides the "In Dreams" many of the other tracks have never been performed live and Mark and the band perform it flawlessly. This shows all of Mark's talents the playing, arranging,composing at his best. You will not be disappointed. Amagigal performance! Mark Doyle's Guitar Noir albums hit the spot for me because I grew up in the '50s and early '60s loving TV detective shows such as Peter Gunn, Naked City, Mr. Lucky, and Johnny Staccato. The one constant in Mark's music career is his ability to surround himself with incredibly talented musicians in support of his vision. This is no more apparent than in this latest live release. He has only performed his Guitar Noir music a handful of times. The group he has assembled for this one is nothing short of exemplary, including a string ensemble. He has even managed to adapt more rock & roll bands' songs into the performance, such as The Beatles, The Rolling Stones, The Doors and The Beach Boys (!). The entire performance is masterful and soulful. You will be drawn into a time long ago in this beautiful, stunning, dark world.